It’s easy now to target Brazil and the World Cup and connect it with poverty and hunger because the world is watching Brazil and thousands of media companies are in Brazil. I remember very well how former president Luiz Inácio Lula da Silva, Brazil, Latin America and Chicagoans celebrated when Brazil won the bid to host the World Cup. I celebrated too! Now suddenly people hate it? I too was supporting groups protesting the World Cup and against displacements but as soon as the protests were politicalized I stepped away and it doesn’t mean I’m turning a blind eye. I refuse to support any events or actions that are politicalized by any groups (left / right) to promote their own agendas. Yes there are many people protesting peacefully, many people protesting violently and many people not protesting, but many have fallen for these politicalized protests. These protests have been promoted by right-wing groups and the private media to discredit the Brazilian government under the pretext of hunger, poverty, and inequality. The private media opposes President Dilma Vana Rousseff’s government and the opportunity is there to discredit her. But where are the rich white and middle class Brazilians who protested against the bus hike? They’re attending the World Cup games while the poor who have been ignited by the protests are continuing the protests. After more than 50 years of U.S. backed military and right-wing governments that ruled with impunity when hunger, poverty and inequality were at their height, suddenly many people in the U.S. become social justice activists and care about Brazil’s social issues? Research how Brazil has improved its own human development in the last 15 years. Research what social programs were introduced by Lula. How many Americans know who Lula was or is? Do you really expect a leftist government can eradicate poverty and hunger in ten years? And because they haven’t eradicated poverty, now people hate them? Come on now! If you do, then go hate Evo Morales, Correa, Maduro, Kirschner, Ortega… but especially Evo. Since elected Leftist President of Bolivia, his government still hasn’t eradicated poverty and hunger but is one of few countries that has dramatically decreased poverty in Latin America. Go take pictures of poverty under Evo’s government. Of course not! Who dares the protest against the first indigenous President after 400 years of White rule in Bolivia? I won’t. 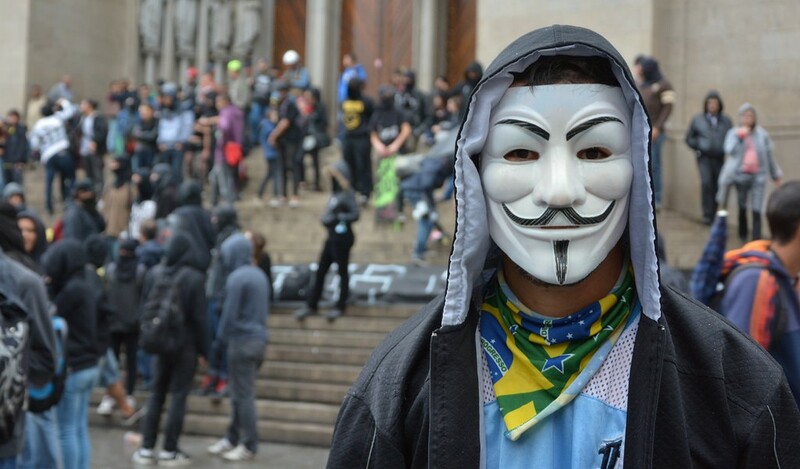 How many Americans or people who are supporting these protests know when Brazil’s next elections are? Not many. Presidential elections are 3 months away and the right-wing groups are banking on these protests to win votes and alliances. If the right-wing party wins, the same people and social activists who have fallen for these politicalized protests, will then protest against their neoliberal economic agenda who have been fueling and funding via media the protests. Look at what happened in Ukraine, Libya, and Greece? Activists and Americans supported the so-called “people’s revolution” and now many of the same protesters have turned back and are now protesting against the new governments because they are backed by ultra-right wingers and Neo-Nazis groups. Supporting these politicalized protests is no different than supporting the U.S. backed right-wing protests in Venezuela and Syria.